Public Safety Minister Mike Morris uses a driving simulator to show the effect of texting and driving. May. 9, 2016 4:00 p.m.
A first offence for checking your phone while driving will cost B.C. drivers $543 when new penalties take effect June 1. The fine for distracted driving goes up from $167 to $368, and drivers will also be assessed four penalty points, triggering another $175 charge. The combination results in a total penalty of $888 for a second offence within a year of the first. Public Safety Minister Mike Morris said the new fines put B.C. near the top of distracted driving fines for Canadian provinces, and two tickets in a year will also trigger an automatic review by the Superintendent of Motor Vehicles that could result in licence suspension. Public consultation over the past year has found support for a tougher approach. “A lot of the input that we had indicated even higher penalties than that,” Morris said. Transportation Minister Todd Stone said the public awareness campaigns have not convinced enough people of the dangers of trying to use mobile phones or other devices without hands-free services. “Imagine trying to drive the length of a football field while you’re blindfolded,” Stone said. Central Saanich Police Chief Les Sylven, president of the B.C. Association of Chiefs of Police, reminded drivers that being at a stop light or stuck in a traffic jam does not mean the distracted driving penalties don’t apply. 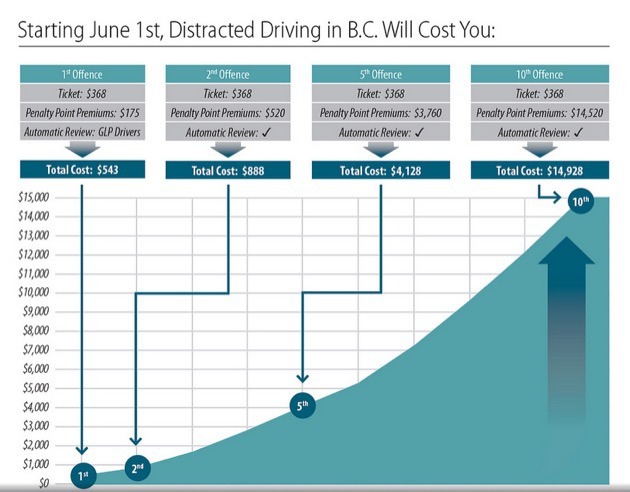 NDP public safety critic Mike Farnworth said the government didn’t need to take a year to increase one of the lowest distracted driving penalty systems in the country, and giving the superintendent discretion over multiple repeat offenders doesn’t send a clear enough message. “Frankly, I think that if you get more than three in the course of the year, there should be no ‘may’ about it, you will lose your licence,” Farnworth said.